Wilton Youth Competition Try Outs will be held on Thursday, September 20th from 5-7PM in the Wilton High School Field House. A parent meeting will follow, starting at 7PM. Competition Cheerleading is a fun and exciting part of the sport, which all cheerleaders love. Competition Cheerleading is where the cheerleaders get to shine and show off their routines! Please come to the try out and parent meeting on 9/20/2018 to see what competition cheerleading is all about! The competition parent meeting will start at 7 PM! Thank you and please feel free to email teagantait.cheer@gmail.com with any questions. 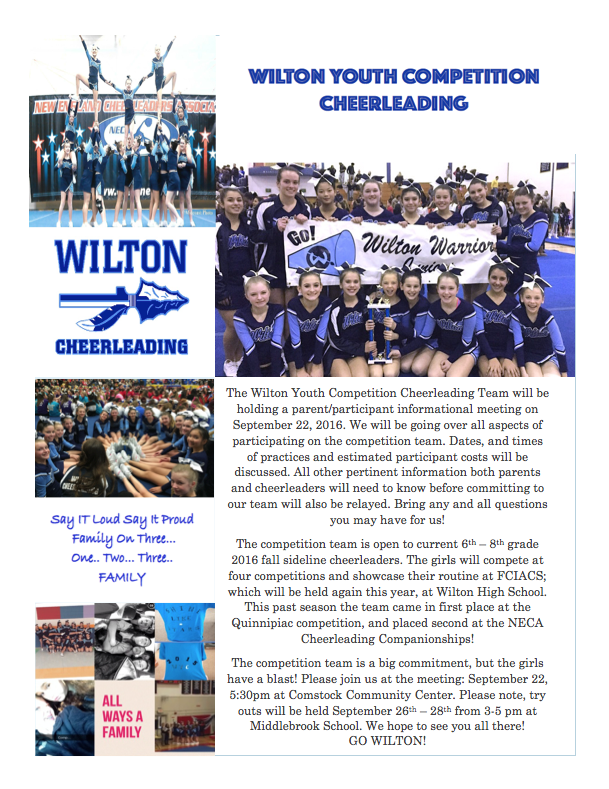 Wilton Youth Football offers a Competition Cheerleading squad for WYF registered cheerleaders in grades 6, 7 and 8. The season runs from mid-October through mid-March. Competition Cheerleading is a dynamic, exciting sport!! Please leave these weekends open as if there is bad weather the competition dates will move to the Sunday of the same weekend. 2/21 - Burt Kahn Gymnasium, 275 Mount Carmel Avenue, Hamden, CT (This is the athletic facility located on the main campus and is NOT the new TD North Arena). *Performance times are sent to the coaches during the week leading up to the competition. On Saturday, March 2nd, the Wilton Warrior Juniors Competition Squad finished it's 2013 season placing FIRST in their division at the New England Cheerleading Association Open Championship in East Haven, CT. The squad is comprised of 6th, 7th and 8th grade cheerleaders from the WYF Cheer Program. The Wilton Warrior Juniors Competition Cheerleading squad after their 2nd place finish at the Gotta Cheer Snow Globe Challenge in Chester, New Jersey, on January 8, 2012. The squad is comprised of 6th, 7th and 8th grade cheerleaders from the WYF Cheer Program. 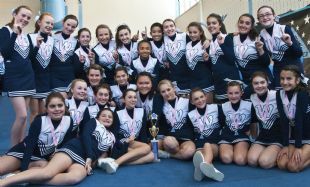 The Wilton Warrior Juniors Competition Cheerleading Squad ended its fantastic 2011 season with a first place win at the New England Cheerleaders Association Cheer & Dance Open Championships in East Haven, CT on March 5, 2011. The squad is comprised of 6th, 7th and 8th grade cheerleaders from the WYF Cheer Program. The Wilton Warrior Juniors Cheerleading squad took first place in their division at the New England Cheerleaders Association Open Cheerleading Competition held in East Haven, CT on Saturday, March 6th, 2010.